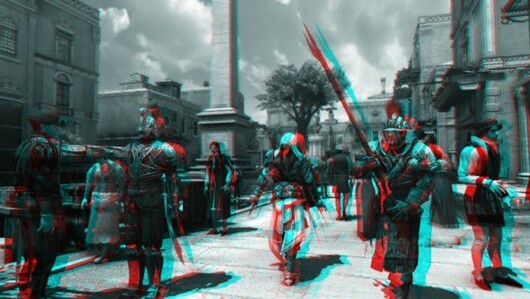 That’s right: The PC version of AC Brotherhood, due sometime before April, will support 3D technology as well as multiple monitors. Joystiq picked up on the new features from a Ubisoft Germany video that rundowns the features, which mostly seem to be about graphical improvements. Here are the specifics. "Specifically, the PC release will support Nvidia 3D Vision and AMD’s Eyefinity tech. The latter allows players to link together multiple monitors for some really widescreen views of Renaissance Italy." Quick, go purchase more monitors so you can get panoramic 3D views of Renaissance Italy’s panoramic vistas.